Sometimes people are described as right-brain dominant or left-brain dominant. Roger Sperry, Nobel Prize winner and Neuropsychologist, described right and left-brain dominance in 1981 when researching the split brain. According to his findings, the left side of the brain controls logic and focus, and the right side of the brain controls creativity. Corresponding to Sperry’s theory, people who are left-brainers excel in project management and they’re inclined to follow productivity systems. Those who are right-brainers are more artistic, and they decide their course of action as they go along. In reality, most people have both left-brain and right-brain characteristics. However, they might have more characteristics associated with one side or the other. We typically associate prioritization and planning with left-brainers. However, the right-brainers use intuition and big-picture thinking to manage their time so don’t discount their valuable skills. Being conscious of the less dominant side of the brain can help strengthen it. This understanding can be useful for productivity goals. Learning balanced thinking skills (using both sides of the brain) can boost productivity. 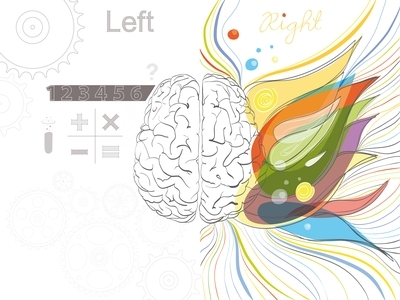 Are You a Right or Left-Brainer? Right-brain characteristics include imagination, artistry, and intuition. People who are right-brain dominant tend to be more passionate, empathetic, and impulsive. They choose professions in marketing, fiction writing, teaching, sales, art, and design. Left-brain characteristics include language skills, logical thinking, and math and spelling skills. People who are left-brain dominant tend to process information linearly when solving problems. They are usually good planners and tend to make to-do lists. They choose professions in science, legal, programming, engineering, non-fiction writing, and health care. If you want to learn if you’re a right or left-brainer, you can take a quick test online. This short quiz from Eterna helps you determine your brain hemisphere dominance. I personally took the test, and it determined that I’m right brain dominant which was not a surprise for me. My intuition told me where my dominance falls. Messy desks can be associated with creative, right-brainers, while clean desks can be associated with the more orderly left-brainers. This is a generalization, of course. I recently discovered an article “Why You Should Have a Messy Desk.” The article states that many of the most successful people in recent history have or had messy desks – including Steve Jobs, Albert Einstein, Tony Hsieh, and Mark Twain. What do these successful CEOs such as Hsieh and other leaders have in common? They’re creative visionaries and big-picture thinkers — most likely, right-brainers. My theory is that they’re heavily involved at the beginning phases of the creative process — the stage that new, innovative ideas develop. And after they’ve designed the new concepts, they hand over the project to the team members who plan, implement, and develop the final products under their creative guidance. After research and thought, I concluded that messiness AND neatness play a role in productivity. A study from the University of Minnesota determined that an orderly environment activates a mindset of following convention and a disorderly environment promotes exploring new ideas. Visualize effective brainstorming sessions in messy offices or conference rooms — ideas flowing freely in an unstructured way. 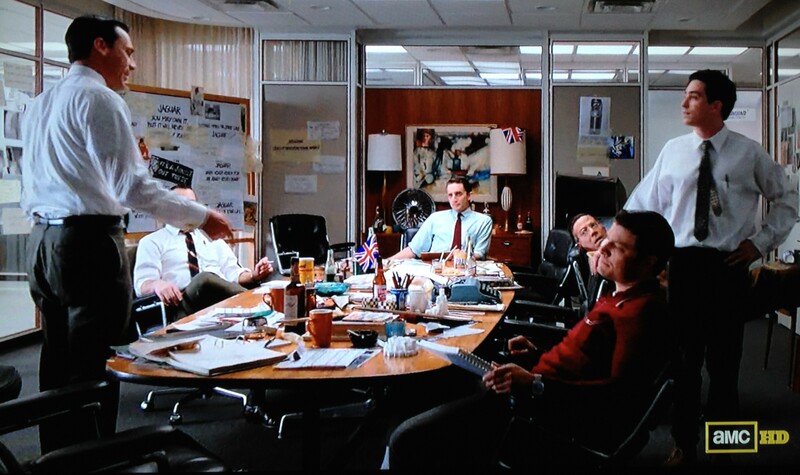 Imagine a creative war room at an advertising agency – think Mad Men. These unstructured spaces are where ideas flow. On the other hand, picture times when you’re getting things done. In my case, I clear my desk of clutter so the things around me aren’t demanding my attention. I’m a right-brainer who employs practices of the left-brainer to boost my productivity. To encourage productivity, consider your task at hand and your brain dominance. Messiness promotes the creative process and neatness encourages the implementation of projects in a conventional way. If you’re a right-brainer, don’t be afraid to tidy your workspace when you’re in the execution phase of a project. If you’re a left-brainer, go with the flow of a messy environment when you’re brainstorming and generating new ideas. You can greatly improve your productivity by complementing your thinking with thoughts and behaviors that don’t come naturally to you. You can also perform brain exercises to develop the less dominant side of the brain. If you’re a left-brainer, you probably believe you don’t need advice for being productive because you have an excellent system in place. However, you might lack big-picture thinking. Do you get bogged down in the details and tend to lose sight of the big picture? Do you analyze the numbers, but lack intuition about the direction you should take? Is finding creative answers to problems difficult for you? Understanding the above weaknesses of the left-brainer can help them to improve their decision-making, problem solving, and productivity. This type of thinking might not come natural; however, the left-brainer can benefit from brain exercises such as drawing, playing an instrument, and playing sports to strengthen the right side of the brain. If you’re a right-brainer, you probably don’t use a productivity system because you intuitively know how much time it takes to complete a project or task. Do you keep your agenda and your ideas in your head and easily visualize your projects and tasks? Do you get your projects done (sometimes at the 11th hour), but forget to pay your mortgage? Do you ignore the numbers and make decisions based on creativity and intuition? Are you late for meetings because you don’t make appointments and use reminders? Using a productivity system or software with projects, appointments, reminders, and tasks can greatly improve the right-brainer’s productivity. The right-brainer can also improve their focus by working in 90-minute intervals with 10-20 minute breaks. Crossword puzzles, Sudoku, coding, writing, and reading (without skimming) can exercise the left side of the brain. Did you take the test to learn your brain dominance? Do the ideas and notions in this post ring true for you? Do you use a productivity system? Comment and let us know!